This chapter provides an overview of silicon-based frequency references. Reduction of size and cost as well as increased reliability have been the main motivations for the realization of on-chip frequency references. However, the main limitation of such references is the effect of variations in process, voltage, and temperature (PVT) on their output frequency. This chapter reviews various state-of-the-art implementations of silicon-based frequency references. These have been mainly introduced in the open literature or available as products on the market. The chapter’s main goal is to provide an overview of the pros and cons of the selected approaches in order to build a comparison chart. 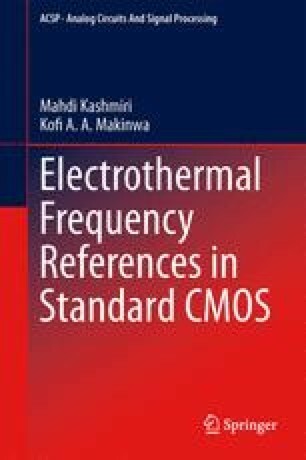 Such overview should help the reader to make a comparison between the approach described in this book, electrothermal frequency references, and the other available solutions.